President Manny Mori signs the 2011 Micronesian Chief Executive Summit pledge to create a shark sanctuary. The Congress of the Federated States of Micronesia (FSM) passed legislation Feb. 4 to create a shark sanctuary in the country’s full exclusive economic zone (EEZ), which covers nearly 3 million square kilometers (1.1 million square miles) in the western Pacific Ocean. President Manny Mori transmitted and assigned the legislation as Public Law No. 18-108. The Pew Charitable Trusts, which has worked the past four years with the Micronesia Conservation Trust to advocate for protection of sharks throughout Micronesia, welcomed the legislation. The measure, expected to be signed into law by President Manny Mori, prohibits the commercial fishing and trade of sharks and their parts. "Our commitment to the Micronesia Challenge includes the protection of the top predators in our ocean," President Mori said. The Micronesia Challenge is a regional declaration of conservation goals to which the nation agreed in 2006. "Our traditional stories say that sharks protect the people. Now the people will protect the sharks." 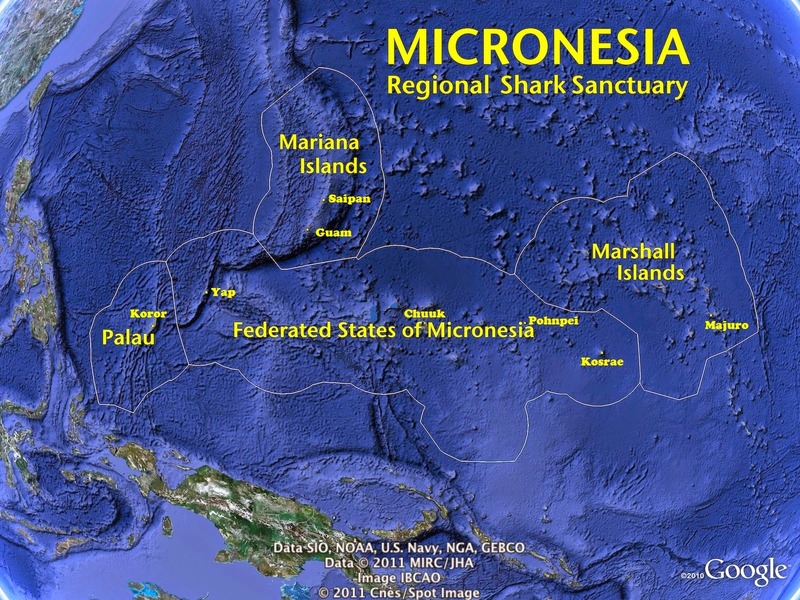 The Micronesia Regional Shark Sanctuary is larger than the European Union. On a broader scale, passage of the legislation marks the completion of the Micronesia Regional Shark Sanctuary, which already includes the waters of Palau (more photos), the Marshall Islands (more photos), and the U.S. territories of Guam and the Commonwealth of the Northern Marianas Islands. In total, the area of protected shark habitat across the contiguous area is larger than the size of the European Union. Creation of the FSM sanctuary follows a grassroots effort spearheaded by the Micronesia Conservation Trust, based in Pohnpei. Led by executive director Willy Kostka, the organization built a coalition of conservationists, traditional leaders, and students to advocate for protection of sharks throughout Micronesia. "More than 8,000 students from across the region signed petitions to support these protections," Kostka said. "This is something the people wanted." "The completion of the Micronesia Regional Shark Sanctuary is truly a landmark action because it joins together a massive swath of the western Pacific as a trans-boundary sanctuary for all the sharks that migrate across this huge ocean region," said Angelo Villagomez, a shark expert with Pew. "We look forward to working with our partners in the FSM to make certain that the implementing regulations ensure strong protections for sharks." The Federated States of Micronesia consists of Yap, Chuuk, Pohnpei (more photos),and Kosrae.